The Transfer of Relics of Blessed Igor, GreatPrince of Kiev: The Kievan GreatPrince Igor Ol'govich, in holy Baptism George (also Comm. 19 September), in the year 1146 suffered defeat and was taken captive by prince Izyaslav, who imprisoned him in one of the monasteries of Russian or Southern Pereyaslavl' (now Pereyaslavl'-Khmel'nitsk). Far removed from the vanities of this world, and grievously ill, he began to repent of his sins and asked permission to be tonsured a monk. 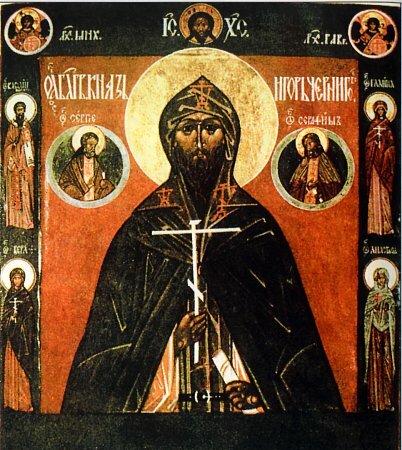 On 5 January 1147 the Pereyaslavl' bishop Evphymii tonsured him into monasticism with the name Gavriil (Gabriel). Soon he recovered his health and transferred to the Kiev Theodorov monastery, where he became a schemamonk with the name Ignatii, and devoted himself entirely to monastic efforts. But the spirit of fratricidal hatred stormed over Kiev. The Chernigov princes, cousins of Igor, plotted to entice Izyaslav of Kiev into a joint campaign – with the aim of seizing hold or even killing him. The plot was uncovered, when the prince was already on the way to Chernigov. The Kievans were in an uproar in learning of the ruse of the Chernigovichi, and they stormed into where the quite innocent Saint Igor was. And on 19 September 1147 Saint Igor was brutally murdered. The Lord glorified the sufferer with miracles. With the blessing of the metropolitan Kliment Smolyatich, the hegumen of the Theodorov monastery Ananii made the burial of the "passion-bearer" in the church of the Kiev Simonov monastery. On 5 June 1150, when the Kiev throne had become occupied by Yuri Dolgoruky, his confederate and a brother by birth of the murdered Igor, – the Chernigov prince Svyatoslav Ol'govich, solemnly transferred the holy relics of Saint Igor to Chernigov his native region, where they were placed into a reliquary "with an attic-garret" in the Saviour cathedral church. And then also was established the feastday in memory of the saint.